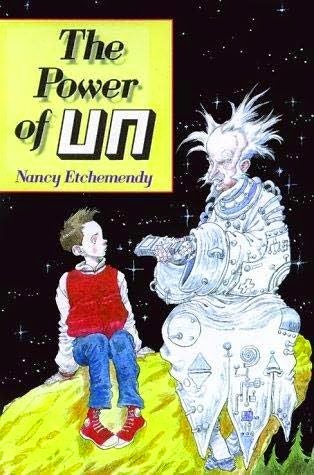 The Power of Un, by Nancy Etchemendy (Scholastic, 2002), is a solid middle grade example of the "do-over" sub-genre of time travel--the sort where you relive bits of you own past and make changes to it that you hope will make it better. In this case, a boy named Gib has had a bad day of your ordinary things going wrong at school and being stuck taking your little sister to the fair with you....nothing to terrible, but enough to send him out on a walk to the woods alone to sort of sulk for a bit before the fair starts. There he meets a strange old man who gives him a time machine, and then vanishes in a tiresome sort of way before explaining how to use it. Gib's bad day certainly wasn't enough to justify a do-over at that point, and in any event he'd dropped the time machine in the darkening woods and couldn't find it again,. But then, at the fair, tragedy strikes, and because of Gib's inattention, his little sister is in a terrible accident. Now it is definitely do-over time....and happily the time machine can be found and figured out. And Gib's bad day happens again...only this time he knows how to make it less bad. But still his little sister ends up at the fair, and still there is a terrible accident. So he tries again. The third time becomes even more important when the time machine gets broken. And the disastrous accident this time around is something that at least everyone can survive, which is good. The time machine is called an "unner," because it un-does, and so (in my mind at least) the title, as well as referencing that, is also a play on the power of one, as in one person changing things. If you think this is deep, you will probably like the book lots. And indeed it is a perfectly fine first "changing the recent past book," that does a good job exploring how little things can, or can't, change the outcome of events. It's thought-provoking, and things move briskly, and I appreciated the little twist at the end, and I can easily imagine 9 year olds thinking it's great. But I myself can't really say it's better than "fine." Possibly because Gib didn't have enough personality for me to be sure I liked him (possibly this is because the kid on the cover doesn't look like the sort of kid I would have been friends with, in which case it is deeply unfair of me). But, you know, you don't have to believe me. The blurb at Amazon says "This fascinating, approachable, and critically-acclaimed sci-fi/fantasy story is blessed with an intelligent and likeable character. The Power of Un was the winner of the 2000 Bram Stoker Award." School Library Journal said "As the story gathers speed, suspense builds to a surprising and satisfying conclusion with room for more than one sequel. The book's themes and plot twists take it beyond the conventional, resulting in a delightfully thought-provoking science-fiction story." My own short answer is that I didn't mind reading it. Although I think if I had had the UK cover, certain sensitive children kicking around might have asked me to hide it. The UK cover is kind of creepy.